So, you’ve just signed up for an email marketing automation tool like Ontraport, awesome! But now what? Well, there are a few simple email marketing automations that I think all businesses should have in their locker. In this post I’m going to give you some actionable insights into three key campaigns so that you can get inspired, get building and start growing your engaged audience. What is a welcome email automation? Okay, so like most businesses that have an online presence, you are probably capturing leads that come to your website and opt in to receive more content from you. Side note – If you are not currently doing this, I would advise that you build yourself an opt in form in Ontraport that you can add to your website. You need to start building your subscriber list as early as possible (even if you have nothing to send to them yet). For example, when that user opts in to your blog, it would be great to send them an awesome welcome email and a few follow up emails with some bonus value to make them feel like you’re the best thing since sliced bread. That’s why you need to build your welcome automation. It’s a simple but effective way to introduce you and your brand to new subscribers as well as giving them a heads up on what type of emails, content and communication they can expect from you. How do you build a welcome email automation? You simply need to need 3 emails to play a part in this campaign and then you need to build the automation in Ontraport or your system of choice. This email needs to set the tone for all emails to come so keep in mind the type of brand voice that you want to portray. A good welcome email also sets clear expectations on what types of future communications the user can expect from you. Do you have a valuable resource that you can share with your new subscriber? Maybe a popular blog post you’ve written, a relevant video that’s been well received or maybe a simple 10% off discount code if you’re an online store. Whatever you can offer, it’s great to surprise your new follower by giving something away for free without them even asking for it. This email is optional but telling a short story about you or your company can really help you build a more personal connection with those followers that are engaged. Sure, some of your new subscribers will just skip this email, but the ones that read your story and relate to it are the followers that will turn into customers. Let’s see how these three emails stack up in a really short and sweet automated email campaign. As you can see in this example, the time between each email is relatively short as it’s best to deliver value to your new leads fast before their enthusiasm wanes. That being said, we don’t to send too frequently as that can be seen as aggressive and ends up just being annoying. Next, we’re going to be walking through a typical prospect nurture automation. 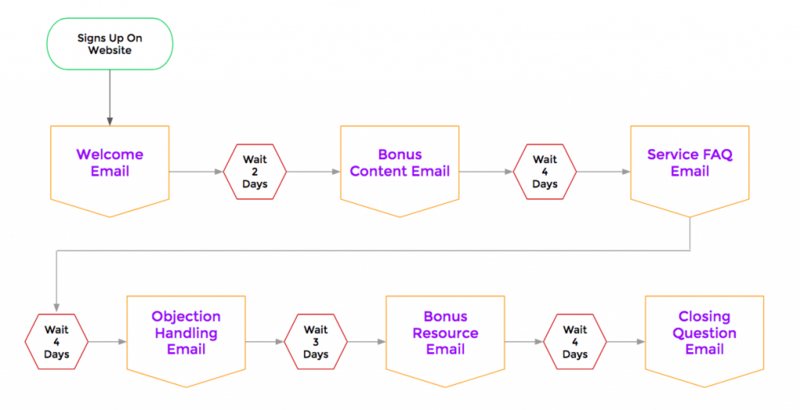 What is a nurture automation? Okay, so automation number two is the prospect nurture automation. The purpose of a nurture automation is to keep in touch with your prospects (users that have entered your sales process) and provide them with extra value and nurture them towards taking the next sales related action. For example, let’s say you’re a personal trainer that offers a 1 on 1 training package at a premium monthly rate. That’s your core service. Now let’s say that on your website you have a free giveaway that includes a diet guide and meal planner. That’s your lead magnet. Anyone that’s using your website and downloads your lead magnet has identified themselves as a prospect by taking taken an action that indicates they could be interested in your core offer (rather than just signing up for your newsletter which doesn’t really indicate much). You’d presume that someone who downloads a free diet guide and meal planner wants to get in shape, right? So, at this point you want to create a nurture campaign that is going to deliver highly relevant content and resources to that user over the course of the buying cycle. Let’s say that your buying cycle is around 20 days. The goal of this nurture campaign is to get that user to take the next step towards purchasing your core service by booking a free 30 minute fitness review session with you. That’s your compelling offer. So, to put it simply, a nurture campaign should focus on taking users from downloading your lead magnet to taking you up on your compelling offer, so that you can sell your core service. How do you build a nurture automation? This really depends on your buying cycle. Nurture campaigns can run over a long period of time with lots of emails or they can run over a short period of time with less emails. For example, if you’re running an e-commerce store for low ticket items, you’ll probably have a shorter nurture campaign because people that come to your website and sign up are probably in the “buying mood”. They’re researching your products so this is a good indication of intent. In this example you’ll probably want to hit them with more emails over a shorter period of time so you can stay at the top of their mind and be there when they look to make a decision. For this second example, let’s say you’re running a B2B service business. Your nurture campaign will probably be longer as the buying cycle tends to be longer in most B2B businesses. A good tactic for this type of nurture campaign is to deliver content that addresses common objections and frequently ask questions. Giving away free resources or valuable content is another great tactic that assists with trust building and allows you to be seen as a leader in the industry. So there you have two nurture examples. You’ll need to get creative to figure out what works best for your business or feel free to contact me for some assistance. 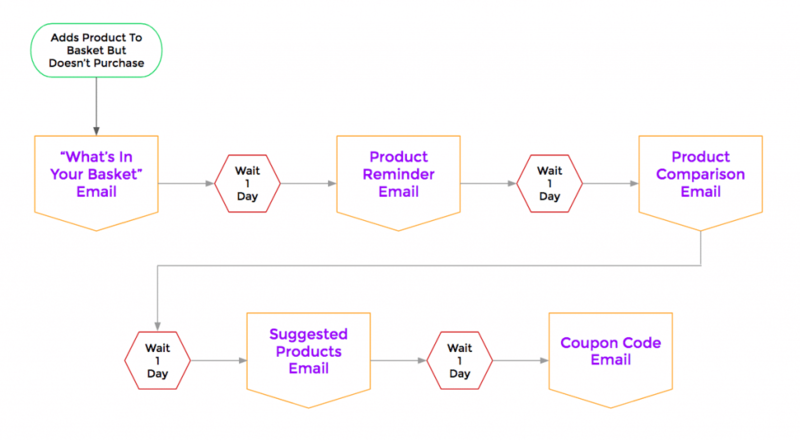 What is a time bound offer automation? Finally, we’re going to talk about time bound offer campaigns. Most businesses run some kind of promotion or offer at some point in the year. Side note – If you categorically never run discount promotions or offers over specific time frame, you can skip this campaign, but personally I think you’re missing out on a huge revenue opportunity. These types of campaigns can be very profitable when done right. The announcement and excitement phase is where you’re going to be announcing the promotion, when it’s going to go live, and trying to build some excitement around that so that you can get people hyped about the launch. Next we move into the launch phase. You’re going to be emailing people on the day that the promotion goes live to give them a clear instructions on how they can take advantage of the offer. Then you’re going to have some follow up emails to try and add value, show proof and get people to take you up on a offer. And then the third phase is the closing phase where you’re going to be reminding people that the offer is coming to an end. It’s important to create a feeling of scarcity on that last few days of the offer to try and convert any people that are on the fence. 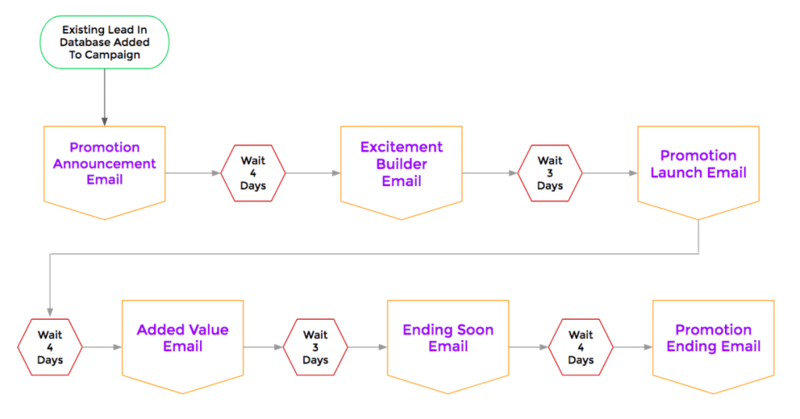 How do you build a time bound offer email automation? Again, just like the last two campaigns, the main things that you need to need to build this email automation are the emails that you will send in the campaign, and some time to build the campaign in your email marketing platform. Side note – This time around, you may also want to consider creating a landing page for your offer to convert users, setup discount codes for you eCommerce store or add banners to your site. It really depends on how you run your promotions and offers. It’s important to realise that there are no set rules for how many emails to send and when to send them, it really depends on your business. Announcing the promotion details, when it will launch, how users can take advantage and any other important information is to be delivered in this email. We’re now looking to build excitement around the upcoming promotion to get the receiver in a buying mindset. Consider sharing customer success stories or testimonials for your service or product on offer. The grand opening email should reiterate the details for the promotion and give a very clear call to action to take the next step. While the promotion is in full swing, consider sending some bonus content or resources to your users that give a taste of your service or product and get them interested in taking you up on the offer. Now you need to start creating some urgency. “The promotion is ending this week” and you’re users really don’t want to miss out on it. This is the “last chance” email. It’s important to have a great subject line and an email that makes it extremely clear that the promotion is ending today/tomorrow. This email is critical to making the most out of your promotion and can sometimes account for the majority of sales made. Once you have these emails made and built in your email marketing system, it’s time to create and configure the campaign. You will be adding your existing email to to this automated campaign rather than the automation triggering when a user fills in a form on your website (to subscribe to your list or download a lead magnet). This automation has a clear start date and end date whereas the other two automations trigger any time a defined action is taken. Whether you run an offer regularly or once a year, having an email marketing automation template setup for this kind of campaign can save you time, keep your promotions structured and allow for easy testing to optimise and improve your results. So, there you have a simple time bound offer email automation to get you started. Feel free to add or remove emails, stretch the time period, do whatever is right for your business. My aim in this post was to outline 3 simple email marketing automations. I hope you found some inspiration to get started tailoring your own email sequences so that you can automate welcoming, following up and promoting offers to your leads and customers.